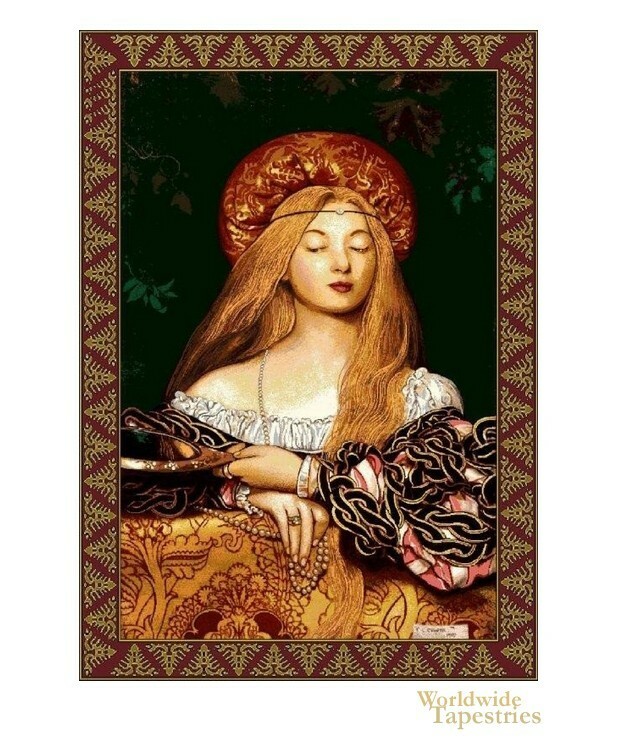 This Vanity tapestry is based on the work of artist Frank Cadogan Cowper from 1907. Cowper has been described as the last of the Pre-Raphaelites and his works includes Vanity. Here we see a young lady holding a mirror, with lush garments and flowing golden hair. She has a renaissance style halo above her head, though instead of being golden white, is flavored with red, to represent vanity and passion instead of holy purity. To some, it is an ingenious twist on the holy portraits of the Renaissance with a lady representing this theme of vanity. Full of gorgeous color and based on the unique work of Cowper, this piece is truly distinctive. This tapestry is backed with a lining and a tunnel for easy hanging. Note: tapestry rods and tassels, where pictured, are not included in the price.